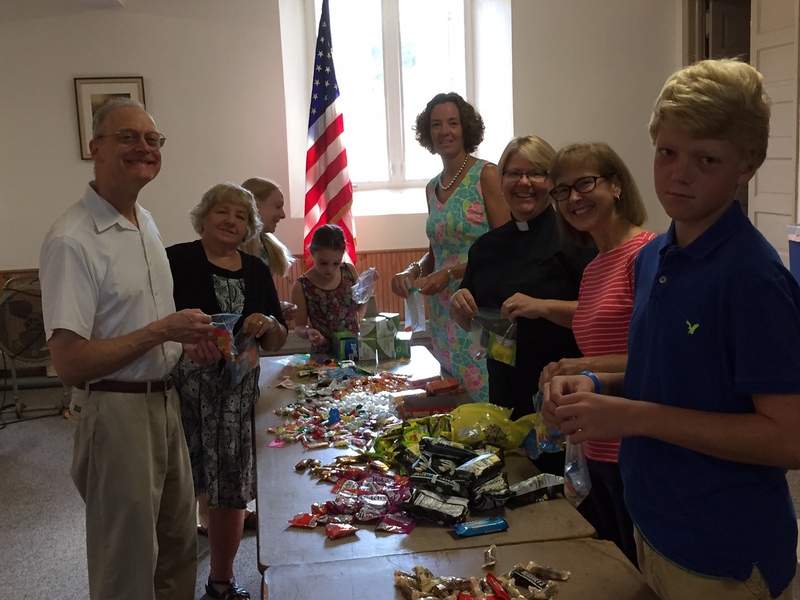 Grace Lutheran Church assembled “goodie bags” for the children of Martin Luther Silver Springs School during our Sunday School time. Members fill baggies with small candies, snacks, cards, stickers, etc. and they were taken to the school for the and will be given out as a treat for the children. Pictured below from left to right are Bruce Reminger, Christine Kertis, Lisa O’Hagan, Emily O’Hagan, Trish Young, Pastor Leslie Richard, Sue Reminger and Brian Young. Sunday, September 11, 2016 – Rally Day! We will be starting Sunday School at 9:00a.m. (Please note time change from 9:15 to 9:00) and the Worship Service at 10:00a.m. This is also God’s Work or Hands Sunday. We will be collecting items to fill small goodie bags for the children at Martin Luther Silver Springs School. This will take place during Sunday School on Rally Day, September 11th and we will gather in the undercroft. We will need sandwich and/or snack size baggies, small fun size candy, small snack packages of pretzels, fruit snacks, animal crackers, crackers, small note books, small crayon packs, card games, stickers, etc. Try to avoid items/toys with strings longer than a few inches and small parts or sharp items. Council Meeting. Please plan to attend. Council members will meet in the upstairs meeting room immediately following the worship service on Sunday, September 11th. Kickoff Picnic and Choir Rehearsal – Sunday, September 11th at 4:00pm. All choir members (former, current or prospective) are invited to our 1st rehearsal on Sunday, September 11th at the home of John and Jeanne Kampmeyer. We will begin at 4 PM with our rehearsal followed by a “pot-luck picnic”. John and Jeanne will supply the entre, drinks and paper products. Choir members are asked to bring either a side dish or a dessert to share. Spouses/significant others are more than welcome to join us! Please RSVP to John. Wednesday, September 14, 2016 – We will be feeding the hungry. If you are available please help with preparation in the church kitchen around 9:30 a.m. and/or help with serving around 6:15 p.m.
Bible Study led by Pastor Richard will begin again in the meeting room downstairs and we will be continuing to study the book of Acts. Please feel free to bring a brown bag lunch and a friend. We start around 11:30 a.m. on Wednesday, September 14th. We will be having our lunch items – hot dogs, chili, soup, soda, water, etc. and we will be selling jars of homemade soup and homemade baked goods. We need your help with making soup and baked goods to sell plus set-up and breakdown and clean up as well as kitchen help and soup and baked goods selling. We will need people to make and jar soups and/or make soup to sell as a lunch item. As we did last year we need 4 different kinds of soup to sell for lunch and 8 different kinds of soup to jar and sell. As we get closer we will have a sign-up sheet.